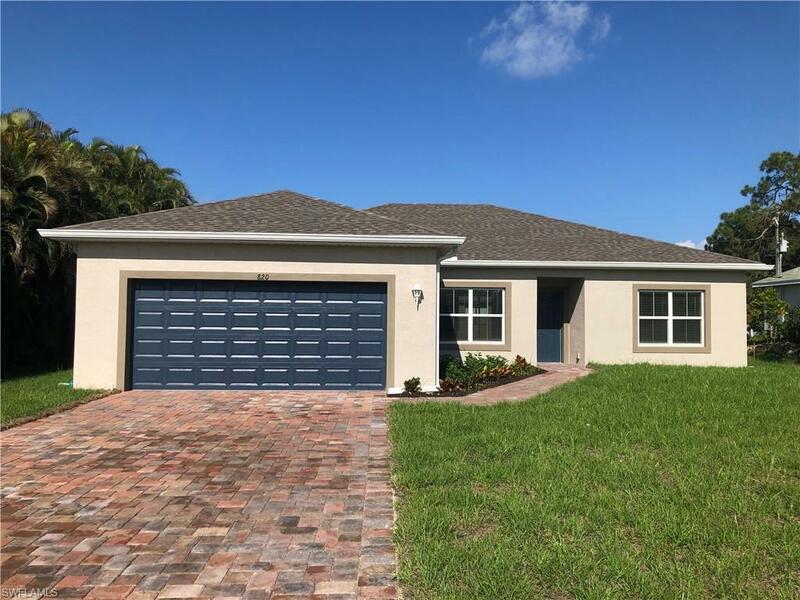 BRAND NEW CONSTRUCTION with builder warranty in a highly desirable area of Cape Coral. 3 bedrooms + Den/Office, 2 bathrooms, 2 car garage. 1664 sq. ft. under air with 9'4" CEILINGS THROUGHOUT. Tile everywhere besides bedrooms, which have stain-resistant carpet. Granite countertops with 4" backsplash in the kitchen and both bathrooms. Stainless steel Samsung appliances. Large walk-in pantry. Master bath has dual sinks, a ceramic tile shower with shelf/seat, separate toilet room, and a walk-in closet. All with plenty of room. Indoor laundry room. Window blinds. Brick pavers in the driveway, walkway, and lanai. Automatic sprinkler system to water your professional landscape package. Storm Shutters and builder warranty included.